Given the dynamic nature of surface water in Kansas, access to maps and data of current and past surface water distribution is crucial to producers and USDA Natural Resources Conservation Service (NRCS) conservation planners. The Kansas Water Map (KansasWaterMap.com), is an interactive tool providing a visual depiction of recent surface water, as well as historical information over the last 30 years. The tool, which was funded by Kansas NRCS through a Conservation Innovation Grant, can be used by conservation professionals, landowners, producers, and the general public to examine patterns in surface water distribution. 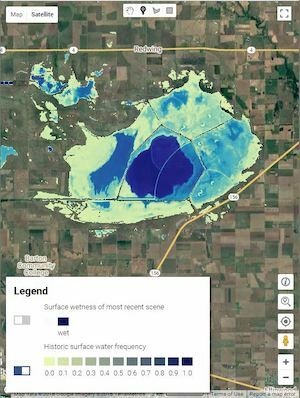 Using Google Earth Engine and LANDSAT satellite data to map surface water, the web map provides historic and near real time coverage of the extent and location of surface water in all Kansas wetlands. An accuracy assessment was completed by comparing georeferenced observations of surface water on the ground with classifications from three different wetness detection algorithms. Total accuracy of the algorithms ranged from 81% to 86%, and the final wetness detection algorithm to be used on the site was chosen as the one with the highest accuracy. An advisory team made up of staff from Kansas Department of Wildlife, Parks and Tourism, Ducks Unlimited, and Kansas Alliance for Wetlands and Streams provided input on the web map and collected ground truth data to assess the accuracy of water detection algorithms. Before you get started, you can view a short video, which walks you through the all the features and shows you how to use the tool. Our tools, including the Kansas Water Map, are made publicly available on Github, a repository used by software developers to share code. A collaborator can quickly and easily download our models and data, make changes, and share those contributions openly with the world.